The Memory of Music launches in Robertson! 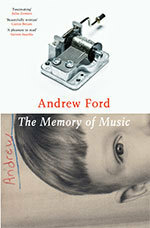 A 'sort of memoir' is how Andrew Ford describes his new book - though it's really about music. The Memory of Music takes readers from Andrew's early childhood in Beatles-mad Liverpool to his work in Australia as composer and presenter of The Music Show on ABC Radio National, where he has interviewed everyone from Joan Baez to Willie Nelson, Yehudi Menuhin to Boy George. The Memory of Music will be launched in Robertson by Tim Pye, TV writer, editor and producer (Love Child, The Doctor Blake Mysteries, All Saints, My Place, Lockie Leonard, SeaChange, Changi and A Country Practice) at a special event at the CTC@Robertson. Phil Slater, one of Australia's finest jazz trumpeters, will perform, and Andrew Ford will talk about his Robertson pieces: Scenes from Bruegel, which used recorded voices of students from Robertson Public School in a live performance by players from the Juilliard School in New York, and Elegy in a Country Graveyard, heard to such good effect in the film, A Place Called Robertson. He'll also talk about his community piece, A Singing Quilt. Tickets are $30 which includes refreshments plus a copy of the book (RRP $32.99) - signed, if you like - or $10 for refreshments alone. Children 16 yrs and under free. The launch is also a fundraiser and all profits will go to the CTC. The book, published by Black Inc., will be in shops the following day.